Jon Payne is interviewed at Christ the Center about how we must consider and conduct our worship. 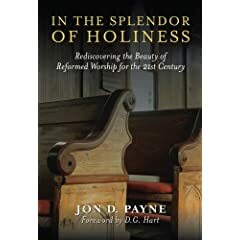 Payne recently published a small book with D. G. Hart on the same subject titled ‘In the Splendor of Holiness.’ This is a small, easy to read book that was written for Jon’s congregation, not for academic study. Though short, it’s too the point. Payne gives careful arguments for why we must not just consider the message, but also the methods we use in our worship. He looks at many aspects to a worship service including the call to worship, Scripture reading, singing the Psalms, and the importance of the benediction. Very eye opening challenges, and helpful explanations. If you are a pastor or worship leader you won’t want to miss this. Payne is pastor of Grace Presbyterian Church in Douglasville, Georgia.